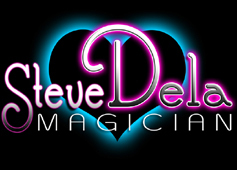 What will Steve's magic do for your wedding day? * Make your wedding even more memorable. People remember where they were when they saw the impossible. * Stop your guests from getting restless during the ‘down times’ eg. whilst the photos are being taken. * Make people smile much more which in turn will improve the look of photographs. * Give something back to your guests as a thank you for attending. Steve can be booked to perform at your wedding in 3 distinct ways. 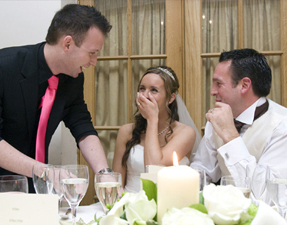 This is magic performed typically in a more informal drinks reception setting - perhaps after the main ceremony and while photos are being taken. Steve will "work the room" by moving from group to group giving 8 to 12 minute performances of magic along the way. 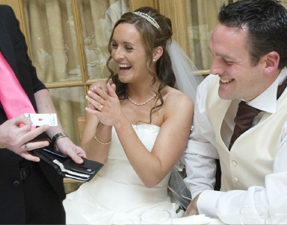 As the name suggests this is close up magic performed while you and your guests are seated during the Wedding Breakfast. As with walkaround magic Steve will go from table to table giving each group a mini performance of magic right under their noses. Steve will obviously pause during the all important speeches! 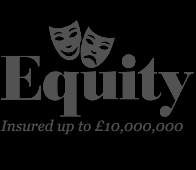 This is effectively a stage performance for all your guests - usually 30-40 minutes in length. Some couples chose cabaret as an "after dinner" option to start off the evening's entertainment. Steve can even incorporate the Bride, Groom or Best Man into his act which always creates quite a stir - and the perfect photo opportunity! How Do You Book Steve? 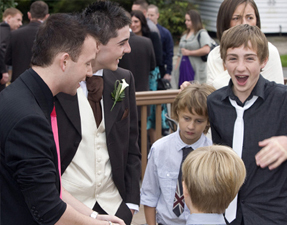 Steve would love to talk to you and explain how he can help you and your guests really enjoy the day. 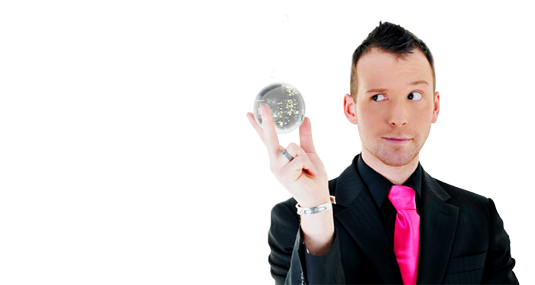 Just contact Steve about being your Wedding Magician , and he’ll be happy to talk about what fits your needs and your day.